On Tuesday, March 27, she will share a unique method for capturing invaluable UX data without having to spend a huge chunk of your marketing budget. I first met Jess three years ago when she was finishing up her Master’s degree in Human-Computer Interaction at DePaul University. She hasn’t taken her foot off the gas since. Jess gave us a sneak peek of her Craft Marketing presentation in this one-on-one-interview. Q: Tell us a bit about yourself. How did you get hooked on user experience? Jess: I came to the user experience field by way of marketing. I worked in marketing communications and research for years, and I realized that in an increasingly digital landscape, there was a whole other layer that influenced why and when people converted into a lead or sale: Specifically, the experience they were having on a website or app. I learned that websites aren’t just online brochures, they are tools meant to help people make decisions and reach goals. I think I really got hooked because user experience rewards our natural sense of curiosity as humans – at its core, UX is about understanding other people and how to meet them where they’re at. Q: You’re going to be talking a lot about user experience. How does that impact all aspects of your website? Jess: Everything we do today has some digital entry point or experience – even if it’s just looking up the phone number or address for your business. The experience people have on your website – and by experience, I mean how successful they feel they were at getting the information they need, understanding if your business meets their needs, and knowing how to continue on to engage with your business – leaves them with feelings about you that are very real and influential to their purchasing behavior. Q: You’ll also be touching on research. How does research impact UX? Jess: There is no good user experience without research. You can build a web or app experience without doing research, but you’ll just be throwing mud at the wall and seeing what sticks. When you research and actually talk to your users, at any point in your site or app’s lifecycle, you’re ensuring you are understanding what your customer needs – and if you’re filling a real need they have in the first place. Businesses often cut research from projects and budgets, but in my experience, it’s the most valuable thing you can do. Q: One aspect of your presentation will be about “guerilla user research.” What exactly is that, and how does it appeal to marketers on a budget? Jess: Guerilla user research is a method that helps you fit research into almost any project and budget. It takes traditional user research techniques and truncates them in a way that makes it easier on small teams, short timelines and squeezed budgets. It’s less formal than traditional research, and more iterative – meaning that you’ll do small bits of research to inform and improve your user experience a little at a time, in a way that’s much more friendly to marketers on a budget. Q: What is one takeaway you think people will get from the presentation? Jess: How to actually do research when you maybe haven’t ever done it before! While it’s not as easy as just going out and asking your customers what they want (UX tip #1: never flat out ask what they want or if they like something), I’ll have some really useful tips that will help you get the most out of guerilla user research. 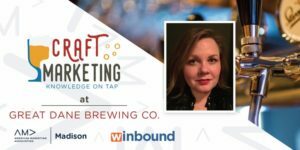 Click here to sign up for AMA Madison’s March Craft Marketing event!